Place all ingredients in the biggest pot you have. 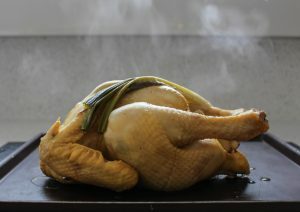 If you can’t fit a whole chicken into a pot, cut the legs off the chicken then place in the pot seperately. Fill the pot with water. Bring to a boil, skimming and discarding any froth off the top of the stock with a large spoon. Simmer for at least an hour, the longer you simmer the broth the better. Remove the chicken and allow to cool on a baking tray. Sieve the stock removing the whole spices and vegetables. Once the chicken has cooled, shred the chicken with two forks, removing the bones and skin. 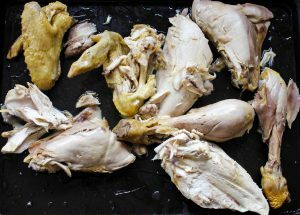 Set the chicken meat aside. 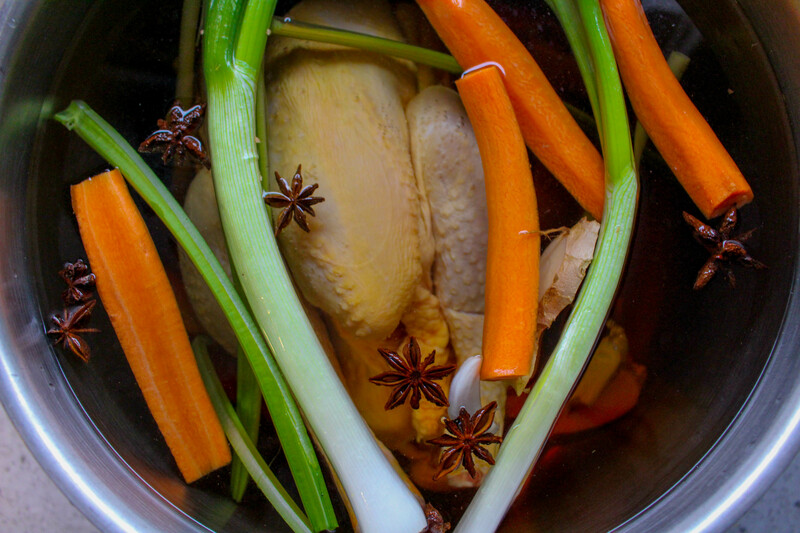 Reduce the stock by returning it to the stove (this will intensify the flavour of the stock). Time spent reducing the stock will depend how diluted the stock is (how much water you have in the pot), so keep checking it regularly. Once you are happy that the stock is flavoursome enough, you can add any finely chopped vegetables, noodles, pasta, rice, chilles etc. Add the cooked chicken, check the seasoning and serve.